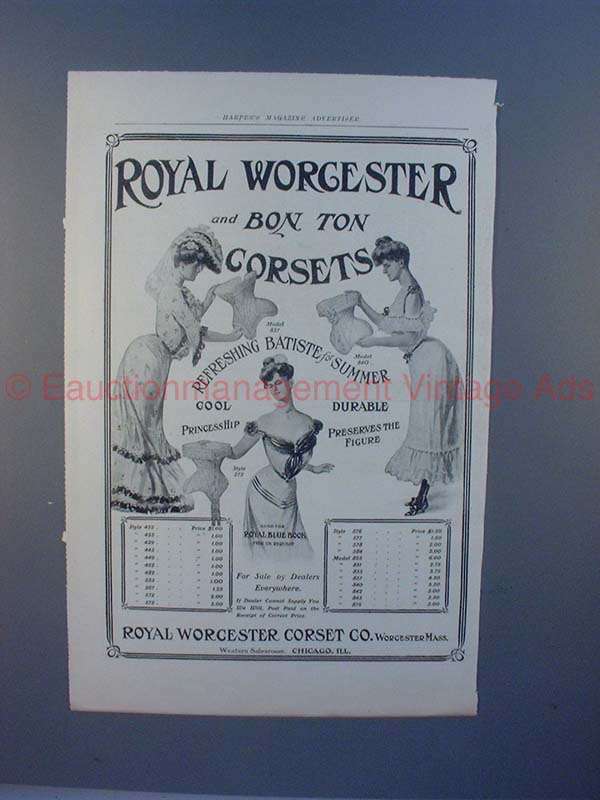 1903 Royal Worchester and Bon Ton Corset Corsets Ad!! Vintage Paper Ads > Fashion > Lingerie - Underwear > Other > 1903 Royal Worchester and Bon Ton Corset Corsets Ad!! This is a 1903 ad for Royal Worchester and Bon Ton Corsets, featuring Model 837, Model 840 and Style 575. The size of the ad is approximately 6.5x10 inches. The caption for this ad is "Refreshing Batiste for Summer!" The ad is in great condition! This vintage ad would look great framed and displayed! Add it to your collection today!